Thank you so much for choosing me to capture that special "newness" of your little one. It is always an honor and a privilege to share these moments with new families. My goal is to make this a relaxing and fun experience. Here are some helpful tips to make sure our time together goes smoothly. Please be sure to follow the tips as closely as you can. I am always able to answer any questions you have! 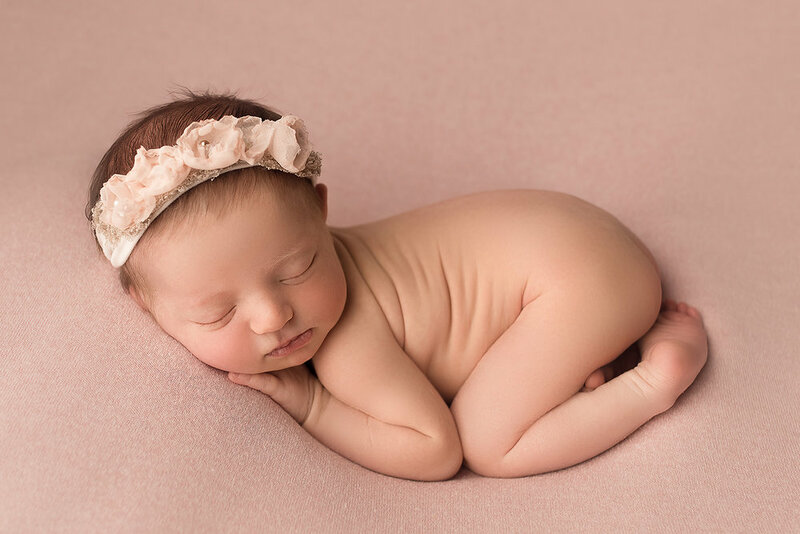 Newborn sessions are best scheduled within the first 2 weeks of life. These sessions usually last approximately 2-4 hours. We will spend time with both poses on the bean bag and props. Family and siblings shots will also be included is some packages. Careful attention is paid to the safety of your baby during the session. With a background as a labor and delivery nurse I have extensive experience handling and caring for newborns. Please note that the studio is kept very warm for the comfort of the babies during the session. It is recommended that parents dress in layers. Sibling and family are usually photographed first. It is strongly recommended that a parent, grandparent, friend or babysitter be available to take the sibling once their part of the session is complete. It’s understandably difficult for toddlers and young children to stay entertained while baby is being photographed in a heated studio for several hours. If other children need to stay, please make sure to bring a toy, IPad, snacks, etc. There is no need to drastically alter your routine the morning of the session. Babies are naturally sleepy however, if possible, try to keep baby awake for about an hour before you leave for the session. A bath, changing clothes/diaper, etc. should provide enough stimulation to keep baby from taking a deep snooze before the session. Please attempt to feed baby before leaving for the studio. In fact, feed baby as much as he or she desires in the hours leading up the session. A full tummy makes for a happy, sleepy baby! Dress the baby in a zip/button up sleeper that is easy to remove and leave the tabs of the diaper slightly loose. I will provide much of what you will need for the session. Bring what you would normally pack if leaving the house for an outing - diapers, wipes, change of clothes. If bottle feeding or pumping please make sure to bring extra formula or milk. If baby uses a pacifier please bring one as it can help with transitions. Although safety and comfort are my top priorities, your baby will be touched and moved more than he/she is used to while sleeping. Sucking is a natural soothing reflex when aroused and a pacifier can help quickly settle a baby while posing if his/her belly is full. I do have extras on hand. I also always have extra diapers and wipes on hand for quick cleanups. 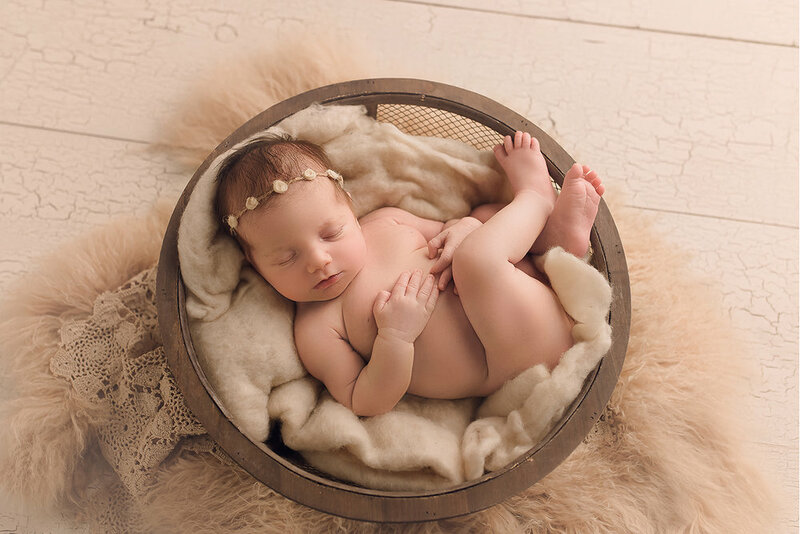 I generally recommend neutrals and solids for newborn sessions. Soft, well fitted knits are always timeless. I find that sleeveless or short sleeved shirts work best as sleeves can distract from the intimacy of the moment. Your hands may also be visible so it is a good idea to make sure your nails are groomed. No need for a manicure however, clean trimmed nails with a neutral polish look best. Approximately 2 weeks after your session you will receive an online proof gallery of approximately 35-45 images from which to select for your desired package. These images will include basic edits. I usually include several fully edited examples for your reference. Selections must be made within 1 week and will be returned for download within 1 week of selections being made. Our studio is located at 8600 Foundry St, Carding Building, Suite 308, Savage, MD, 20763.